We have law and rule separately in our country for sure but the question is “do we have rule of law together?” The experience of 2012 and 2013 is yet alive in our minds. Especially the days of December in 2013 and January 2014 are difficult to forget. Throughout the year of 2013 the whole nation was kept busy with the judgments of International Crimes Tribunal accusing Bangladesh Jama’ti Islami Leaders for so-called war crimes and crimes against humanity held during the liberation war of 1971. As a result, there was dissatisfaction and resentment among the party leaders and general public. Especially after the announcement of death penalty of Jama’ti Islami Leader Moulana Delwar Hossain Saydee public outburst went out of control of the government. 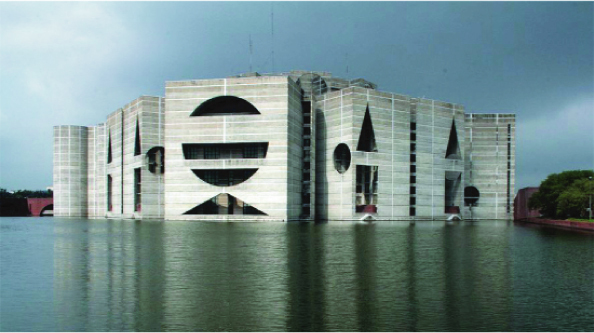 It was a largest incidence in the history of Bangladesh where around 250 people sacrificed their life facing the gun shoot of the government forces while they were protesting against the judgment of this immensely disputed tribunal. These 250 people were from different political parties, classes and professions and notably there were people from ruling party who used to love this opposition spiritual leader greatly. That time the regular basis announcement of judgments of the International Crimes Tribunal was a master-plan of the government to push the oppositions to violence. To carry out this plan government appointed some hired gangs and notorious criminals along with Bangladesh Chatre League (BCL) men whose main job was to commit violence in different places by the name of oppositions. Setting fire in trains and buses, killing and abducting opposition leaders and vandalizing public property were some of their scheduled jobs. Government’s this plan was drawn especially for two purposes. Firstly, if, with the valance, government can prove that oppositions are connected with violence and terrorism then it will be easy for them to convince the out world the legality of their 5th January biased election. Secondly, every incidence of violence followed filing of a large number of criminal cases against opposition leaders, which ultimately kept them busy to hide underground, so that holding of a partial election became an easy job for government. This pre-planned violence facilitated the government to claim the legality of their extra-judicial killing of opposition’s leader. So there was no rule of law. But at the end, government’s plan to ascribe the oppositions for violence and terrorism became inefficient as government’s hired men were caught with hand bombs and cocktails in several places. The consequence of that violence was fatal and wide-spread. Many innocent people were killed in political violence, brutally, burning. Several lives and property were lost throughout the country. Dozens of lawsuits were filed against the opposition leaders. These cases are still under investigation. These leaders are still seen running in different courts for bail. But for the death, fire and atrocities it does not seem to have any actual culprit has been caught. However, as a new dimension of extra-judicial killing many opposition people were shot by the name of gun-fighting in many parts of the country. No rule of Law was seen anywhere. In 2003, during the regime of BNP, an Act was passed byParliament for impunity of the joint forces for deaths, injuries, destruction of property and additional incidences during the so-called “Operation Clean Heart”. From October to January 2003 joint forces were exempted from any accountability or judicial trial for all of their actions. During those three months 58 people were died at the hands of law enforcement agencies. As such the continuation of actions in 2003, in 2013several people were killed without any justification by the name of controlling law and order situation. Day after day the opposition leaders were detained in theirhome guarding by government forces. We had nothing to do but to be silent viewers. And politics has been changed roughly in front of us. A decade ago after Nine-eleven, the President of the United States began to use the particular language to justify the invasion of Iraq and to subdue the Islamists; also our politicians are now using the same language. We are becoming Americans. The way United States follows throughout the world to force everyone to cool down and the language they use against the so-called Islamic terrorism, our government is following the same way by using the same language. Islam is synonymous with terrorism in the US-led Western world. To eye wash the Muslims around the world the language they speakis a strategy for legitimating their brutal actions in different parts of Muslim world. Likewise, to suppress the opposition, our government is using the same language so frequently. By using some words such as, terrorists, extremists, militant, anti-liberation they are legitimating all of the atrocity and brutality against the oppositions. As such, they are terrorists so everything is permissible with them. Some government sheltered Medias are furthering government’s this ill-motivated action. Americans do not value any law for fighting its opponents. In throwing nuclear bombs in Japan, firing bombs or killing innocent people in Vietnam or indiscriminate bombing in Syria-Iraq for fighting ISIS they do not bother with any law. However, there is a small difference between us and Americans, all they do with their opponents, all are foreigners. They adhere to the rule of law with the citizens of their own country. We treat our own country’s oppositions as such as the Americans treatthe foreigners. We do think rule of law does not apply in case of oppositions. Elections are being held in many third world countries. However, it is not any sign of democracy. Egyptian President Hosni Mubarak was elected for three decades regularly before being driven out. Jatiya Party was won by a huge majority in parliamentary elections in 1988 and1986. BNP won in February 15, 1996 election tremendously. A few months ago, Assad won in Syrian election under whose regime thousands of people have been killed in the civil war. Cambodian Prime Minister Hun Sen, who visited Bangladesh a few months ago, has been electingsince 1985. Like all these elections, an election was held on January 5th. Many said it was held in accordance with the law and the Constitution. We can say the 5th January election as an election if we mean only ‘impunity’ by the term the rule of law. If we understand turning day into night or turning truth into false by the term rule of law then 5th January election must have justifications otherwise not. If the current trend of rile of law continues we are likely to see more elections similar to 5th January in future. Under the current ruling party participating in election for BNP is not possible anymore. After the acknowledgement of Mr. H. T. Imam on November 12th regarding the politicizing the election commission the possibility for a fair election under the present government has lowered to zero percent. The only option is left to us is to amend the Constitution to form a system of election time government otherwise the next election will also be held with some domestic oppositions and possibly the next one also. For this government to avoid the useless election encumbrance and to save costs they can bring an amendment to the Constitution as like as the Fourth Amendment stating that the winners of January 5 parliamentary election shall be deemed to be elected for the next two terms as such way that they have been elected by the direct vote of the people. Election was deemed in such a way in fourth amendment by the present ruling party in that regime. In March 1973, the firstparliamentary election was held for five-year term. But in January 1975, the fourth amendment, said thatparliamentary term would be first five-year. However, the five-year period would be reckoned from the date of the Fourth Amendment not from the election. That was also the rule of law according to the sycophants of present government. To ensure the so-called rule of law and the independence of judiciary, Sixteenth Amendment Bill of Constitution was passed in September 2014. Now the power to remove the Judges of The Supreme Court, Election Commissions, Public Service Commission, Anti-Corruption Commission, Human Rights Commission and other constitutional commissions is vested in the hand Parliament.Election Commission, the Judiciary, Anti- Corruption, Human Rights Commission etc. are now in the fear of their removal. In fear of their removal they will not dare to go against the actions of government. Rule of law seems now the will of Parliament. Hitler was a dictator in Germany who could not tolerate any opponent views. Our Government is same and concerned over any opponent views in electronic or social Medias. Blocking Facebook or Tweeter accounts or arresting people for their opinions are some common incidents. Oppositions are not given any chance for political movements. On last 24 December BCL men driven atrocity in old Dhaka while BNP men were heading to court for a Judgment of opposition leader Kahleda Zia. Hitler dreamed to be the most powerful leader in the world, our present Prime Minster already holds omnipotent power. Unprecedentedly she holds and exercises unchecked State power. And even after the 5 January election her powers were increased to a large extent. So no rule of law can be expected from such a dictatorship. Conversely if we justify the basic concept of rule of law, the principle of rule of law is that individual, whatever his position is, is less important than law. Everyone is equal to the law and everyone can exercise the equal opportunity and protection under the law. From the justification of judicial and extra judicial killings, oppression upon oppositions we can easily say that we may take several years to reach to a minimum standard of rule of law or even not if the present govt. runs the country in the way they are running now. Crossfire, gun fighting and so forth are some lies of government to legitimate their actions against the oppositions. They make believe that cold-blooded killing of suspected terrorists and criminals are the most effective ways of crime reduction.We all have to pay damages of extrajudicial killings. In this situation the rule of law is a day dream for us. And without the rule of law no country elsewhere could develop before. That means this government has failed to ensure the rule of law and we will be exploited, abused, oppressed and our rights will be denied till the present govt. will rule the country.